Do you want to improve your skills in mathematics, with a course that explains things as clearly as possible? This online course introduces, in a simple manner, advanced mathematical concepts like complex numbers, polynomials, conics, anti-derivatives, vectors in 2D- and 3D-space, and advanced trigonometry. It will serve as an online study aid for anyone wanting to perform better in class or just to explore the rewarding world of mathematics. With this online course, which you can take anytime, anywhere, you can get a better understanding of advanced topics in math. Along with learning how to calculate complex numbers using the simple operations, you will also learn how to apply the DeMoivre’s Theorem and use polar form multiplication and division. The course will also give you a clear run-through of the relationship between graphs and their anti-derivatives, which will make your future math studies much easier. Next, you will receive simple lessons in statistics, such as how to process nominal, discrete, and continuous data in frequency tables. You will then learn how to apply the product rule in calculus and easily perform calculations of differentiation. The course will then give you a good grasp of the concepts of anti-derivatives including hyperbolic functions, partial fractions, linear substitution, and odd and even powers. If you are a student looking for a clear and free online math course to supplement your current math studies, this is the course for you. 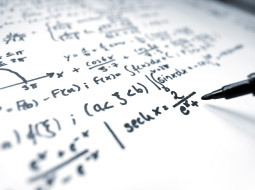 For many, math is quite boring and difficult, but once you get a clear understanding of core mathematical concepts, the rest of the subject can become much easier. This course will do exactly that. So, start the course now, and boost your math skills in no time at all. Upon completion of this course you will understand nominal, discrete and continuous data in frequency tables. You will know the product rule and you will be able to easily perform calculations of differentiation. You will gain a good knowledge of anti-derivatives including hyperbolic functions, partial fractions, linear substitution, odd and even powers. You will understand the relationship between graphs and their anti-derivatives. You will be able to calculate complex numbers using addition, subtraction, multiplication and division. You will be familiar with DeMoivre's Theorem, polar form multiplication and division. This course will teach you how to calculate conics, degrees, radians, inverse circular functions, polynomial equations and much more.